The region known as Campania had the Opici and Aurunci peoples as its first recorded inhabitants. Where Naples is today, the first of the Greek colonies was at Cuma during the 8th century BC. 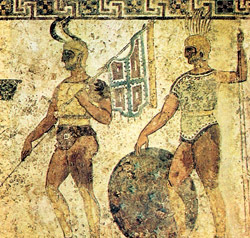 Etruscans were next to rule the region during the 6th century BC and the Sannites followed and ruled until the Roman Empire annexed the area in the 4th century BC. What followed was a fairly peaceful and stable period until the abrupt eruption in 79 AD of Vesuvius. The eruption caused the complete and total destruction of the cities of Herculaneum and Pompeii. Once the Roman Empire saw its demise, the region became the battleground of the Byzantines and the Goths as both tried to seize the area during the 5th-6th centuries. Amalfi and Naples were republics that were independent, but Campania became part of the Lombard Duchy of Benevento. Robert and Roger Guiscard both Normans were responsible for reuniting Campania in the 11th century when they wrested the area from the Byzantines who had thus dominated southern Italy. The Kingdom of Sicily in 1139 was invested by the Pope to Roger II who was a nephew of Robert. When Charles of Anjou or Charles I in 1282 lost Sicily, he still managed to keep the territories on the mainland. Known as the Kingdom of Naples, the area included Campania, Calabria, Puglia, and Abruzzo. Naples was the capital. The Kingdoms of Sicily and Naples united and again separated. The Spanish ruled the area from 1504-1713. Once the Treaty of Blois ceded Sicily and Naples to Spain, southern Italy saw the next two centuries bring about an era that is said to have been a time of immense poverty and exploitation. Disease and famine ran rampant as agricultural pursuits were interrupted by land grabbers of both the Spanish nobles and the Church.